Once the center of colonial world – today forgotten islands of East Indonesia. Banda islands were original place of nutmeg, which grew nowhere else and thus was of huge value in 16th century. Nutmeg was used as food preservative and also believed to cure many diseases. That was the reason for it’s bloody history and almost entire genocide of local population. Dutch and British were fighting over these tiny islands with big efforts and even exchanged Rhun island for island of Manhatan, which seemed to be good deal that time. As the nutmeg started to spread to other places and countries, interest in Banda islands decreased, until they were totally forgotten. 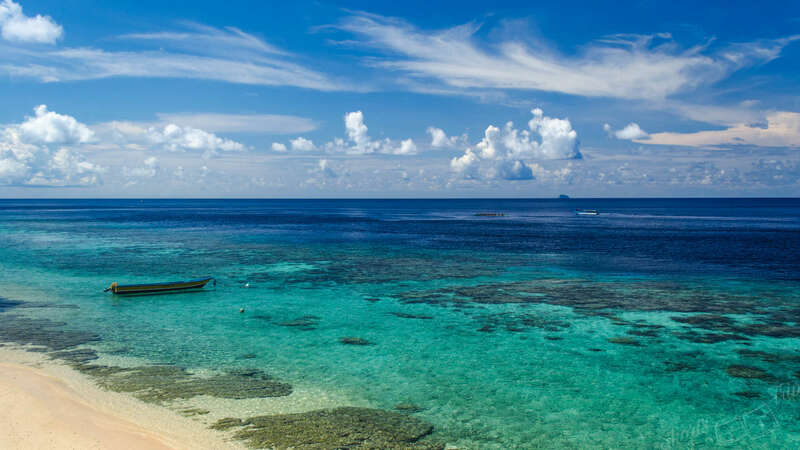 Today it slowly gains it’s popularity for amazing snorkeling and diving which is in Indonesia’s Top 3. 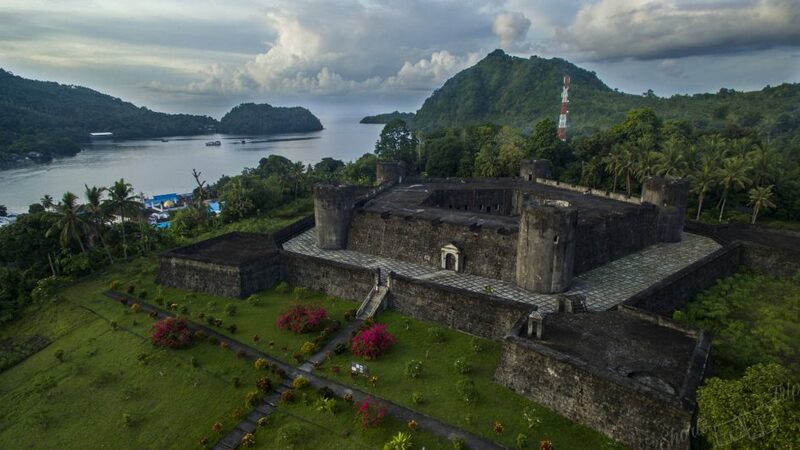 Together with remains of colonial architecture and overlooking Api volcano it is a must for any traveler out of beaten path. 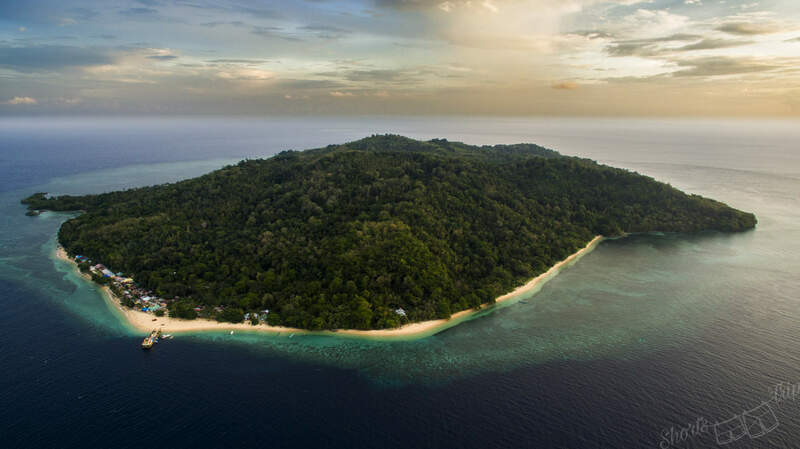 There are 3 choices how to get to Banda islands. The cheapest and most reliable is by Pelni boat from Ambon (8 hours) 4 times a month. 2nd alternative is by speed boat from Ambon (6 hours), which is more expensive, but goes 3 times a week. The last option is to fly from Ambon (1 hour). The plane comes twice a week. Please note that Banda islands are remote area of Indonesia and while transport here is quite reliable, it may happen that schedule will change or transport will be suspended due to weather or other unforeseen incidents. So it is better to have flexible plans and adjust with the current situations. Banda islands are worth it. Then they returns in opposite order, so you can also reach Banda from Papua/Maluku. The ships are huge for 1000 – 1500 passangers and only locals use it. The price from Ambon is 110.000Rp which is by far the cheapest way how to get there. Note that routes might change in future, so better check schedules on official Pelni website. More about travelling by Pelni in our another article. The speed boat is convenient way how to reach Banda in high season if you don’t suffer from sea sickness. It goes usually only February – May and September – December, regularly 3 times a week and takes 6 hours to get there, so you don’t have to worry much about schedule. The price is 410.000Rp. Just note that unlike Pelni it leaves from the port which is 45 minutes by taxi from the city of Ambon. Edit September 2018: Speed boat is still suspended now due to big waves, but should be operating soon again. The small Susi air plane with capacity of 12 people flies from Ambon to Banda Neira twice a week (Wednesday and Saturday) and leaves back immediately the same day. The price is surprisingly cheaper than for speed boat – only 380.000Rp. Note that checked-in luggage allowance is only 10kg and you will pay 22.000Rp for every extra kilogram. The ticket can be bought only at the airport office at Banda Neira or Pattimura Airport in Ambon (no online booking) and tickets are usually sold out a week ahead. It is the main island and a strategic point for further island hoping. It offers good and cheap accommodation. 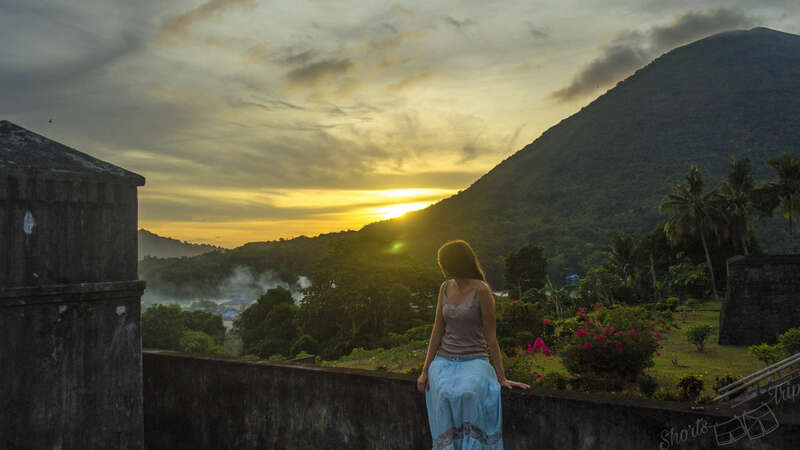 You can stroll through the streets and search for last colonial buildings or enjoy the view from Fort Belgica during the sunset – it is really magical experience. It is the only island which has ATM, so prepare enough money for your stay on other islands. There is plenty of cheap street food (mostly variations of yellow rice, fish and coconut) for 10.000 – 15.000Rp. Definitely don’t miss smoked tuna on the stick (10.000Rp) or local ice desert Es Campur (5.000Rp). The best accommodation amongst backpackers is definitely Vita guesthouse (+6281247067099). It is on the coast close to the port, main market and has views on Api volcano. The price is 175.000/200.000Rp – fan/aircon double room with amazing breakfast and free coffee or tea. It offers a quite good wifi. They can also organize snorkeling trips around surrounding islands according to your wish. There are plenty of alternatives around for 200.000Rp if full. For more luxurious stay try Cilu Bintang (350.000Rp double room) built in a beautiful colonial style. If you want to book your accomodation online and hassle free, there is already one beautiful place to stay at. 666m high volcano Api overlooking Banda Neira is a good target for any hiker. The boat will bring you there for 10.000Rp per person from Banda Neira in 3 minutes. 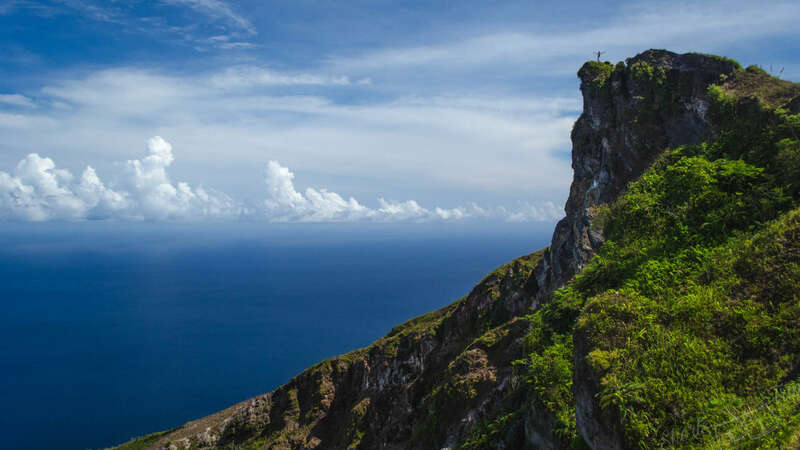 It is demanding hike to reach the top, but easy to follow and views are amazing to all surrounding islands. Definitely wear good shoes, not possible in sandals due to loose scree. Hike up will take 1.5 – 2 hours and bit less to get down. Bring plenty of water and start early to avoid heat and humidity. 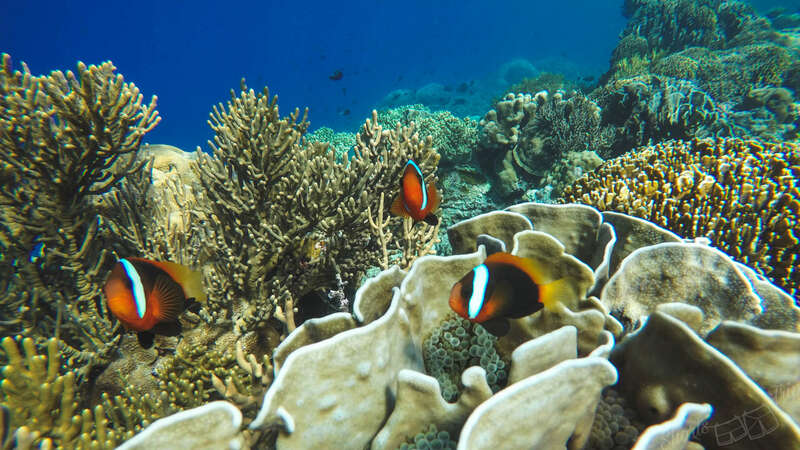 The best snorkeling of all Banda islands, just 20 steps from your beach cottage. The image of paradise takes a real form here. 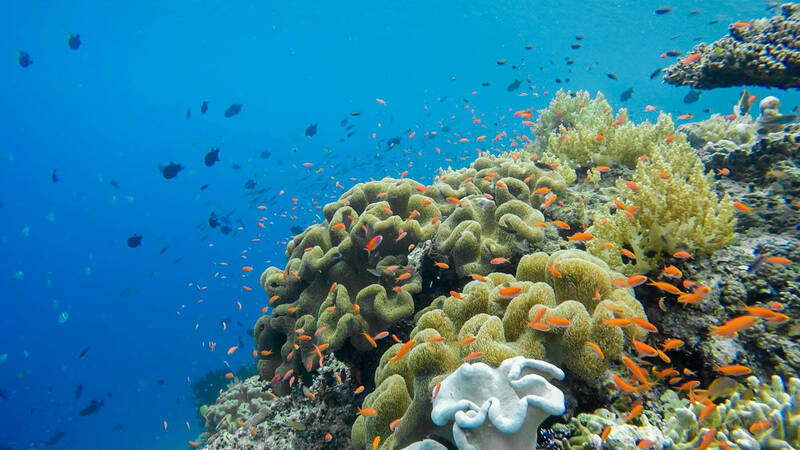 Beautiful corals with colorful fish all around you just as you enter the water, 5 meters of swim and you are at infinite drop off to the deep blue. We recommend to wear either fins or shoes to the water, because of the presence of stonefish which is higly poisonous and you can step on it. The chances are really low, but in Hatta without any real help around, you don’t want to try your luck. Beside many different aquarium fish you can see turtles, claunfish, lionfish, murai eel, black tip sharks, parrot fish, trigger fish, napoleon fish and so many more. If you are lucky and persistent you can even see hammerhead shark. Public boat leaves from Hatta 3 times a week to Banda Neira jetty. Monday, Wednesday and Saturday around 7am. Same day it goes back to Hatta around 12pm. The price is 40.000Rp one way. But guesthouses sometimes organize their own boats for similar price, so just ask around. All accommodation on island has 3 meals per day included, because there are no restaurants or warungs there. The food is plentiful, fresh made and so tasty. The price is bit above backpacker budget, but for few days totally worth it. 200.000 – 250.000 per person for double cottage on the beach. In our experience the best cottage is Sarah homestay, the one totally on the left side (standing with your back towards the water) from the jetty – 200.000 per person meals included. The budget option is Rozengain homestay – 2 bigger building on the right side of the beach. In smaller house are 4 very simple rooms which you should be able to bargain to 150.000 per person with meals if the island is not full. If you prefer to be away from the main beach you can go to the right side from the jetty. It is difficult to reach during high tide. Behind the corner you will find 1 house bit higher on the cliffs which has 2 rooms and represents private island experience. We were offered price 250.000 per person with meal. 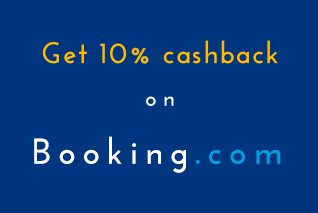 It is possible to bargain in any accommodation if you stay longer than 4 days or if you come in low season. 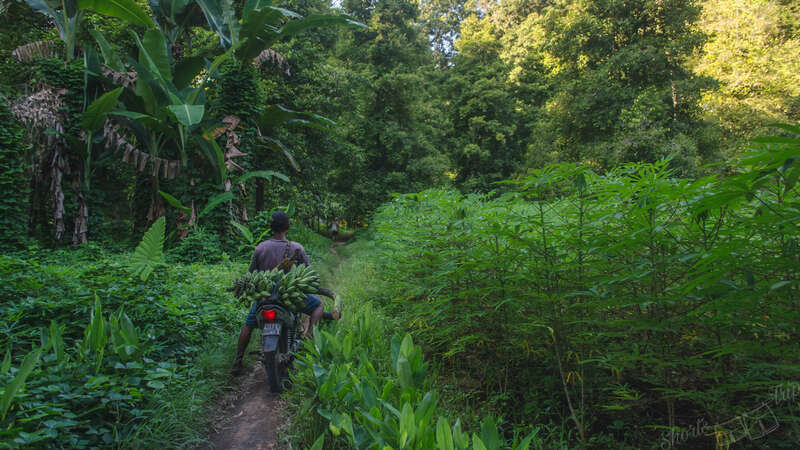 There is no phone signal coverage on the island, but your host from Banda Neira can send a word. There is no water supply on the island and all water is collected from the rain, which means all “bathrooms” are mandi style (ladle and bucket) and refilled once empty. The island is very similar to Hatta with few differences. The reefs are not so rich as in Hatta (still plenty fish though), but you can see many black tip sharks on the long beach of west coast. We saw about 20 sharks during 1 snorkeling. Also the visibility is better here. And last reason to visit the Ai island is nutmeg plantations. 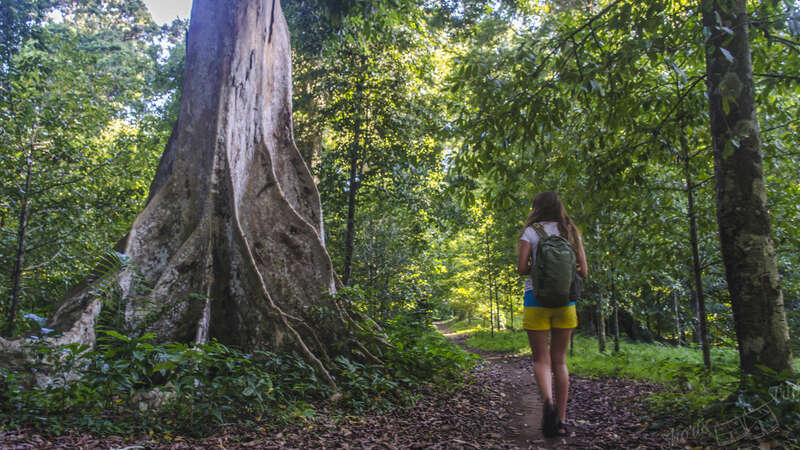 Walking through the forested heart of island is like step to another world. Nutmeg trees grows in shadow of huge Kenari trees which trunk looks like dinosaur legs. It is walk like no other. Public boat leaves from Ai at 7am direction of Banda Neira every day. It returns with passengers going to Ai around 10-11am. Accommodation works in same way as in Hatta. Meaning double room with mandi comes with 3 meals per day. 1st option is Green Peace just next to the Jetty. 4 front rooms have sea view and for 150.000Rp per person it is tempting option. Owner is nice and informative. Just location might be a bit noisy. Can be booked via phone. 2nd and very similar option is Green Coconut (+62 812 424 106 67). 2 out of 7 rooms have magnificent sea view on Api and being bit on the (left) side makes them very peaceful. Included meals are served on 2nd floor terrace where you can also later relax in prepared hammocks and fully enjoy the sea atmosphere. Owner knows everything about islands, so just ask. The price for double room is 200.000Rp per person. 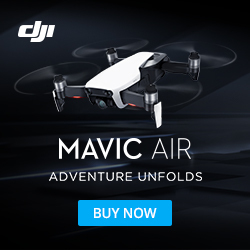 Ai has a satellite which provides mobile network connection from Jakarta, so you can book your accommodation via phone reservation. The mobile internet is very weak there tho, so don’t rely on that. Note that island has conservation programme and as a visitor you are obliged to pay the fee. It is 25.000Rp per day or 50.000Rp per week. It is the biggest of all islands with big nutmeg plantations, some secluded beaches and great snorkeling. 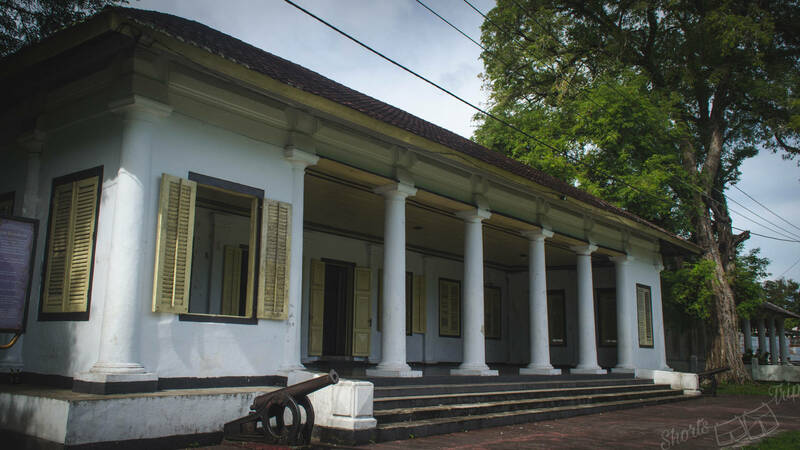 You can also find there ruins of Benteng Hollandia – once one of the biggest forts of Dutch Indies shattered down by 1743 earthquake. We haven’t visited the island though. Famous more for diving than snorkeling has great white-sand beaches and peaceful atmosphere. It is the furthest of all islands, but boats come there daily. It has few homestay accommodation in similar price range as Hatta and Ai. Banda islands should be on every traveler’s list who looks for different Indonesia. Beside best snorkelling, islands offers laid-back atmosphere and a story written on the most interesting historical backgrounds. We planned to stay only 10 days, in the end stayed 1 month and now hope we will come back once again. 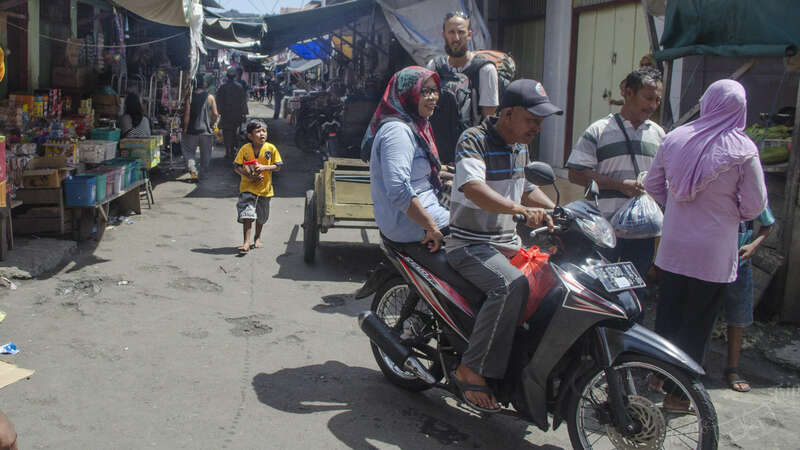 And if you travel long term around Indonesia, you might be interested in article about social visa to Indonesia and how it works with visa in reality. Great post! I loved Hatta Island so much. It was the best snorkelling I have ever done! 🙂 And Sara’s food is the best. Thanks, it is the real paradise. Hi! How do you contact Sarah in advance if we want to stay at her homestay? Thanks!